It would be niece to connect a vacuum hose up to the sander. I guess it’s possible and I plan to tackle this problem and I will let all you LJ’S know what I come up with.Oh one more thing the 4” model is better yet but it is heavier yet and lends it self more to production work. Nice review, on a handy little tool. My 352 has been my go-to for years. And yes, a vacuum is very handy. Strip the bag off of the tube. Many aftermarket adapters available. It won’t get it all, but it will get a lot. 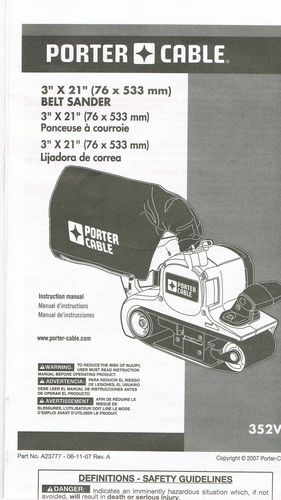 Great Review, Once again Porter Cable makes a great tool. Nice review. I agree about the dust port and bag. But, it sure works! Mine is the 4” model and it’s a beast. I’d rather have the smaller one. My favorite belt sander. Too bad they can’t build one that stands up to semi-annual use. Six sanders in 16 years. is three too many.